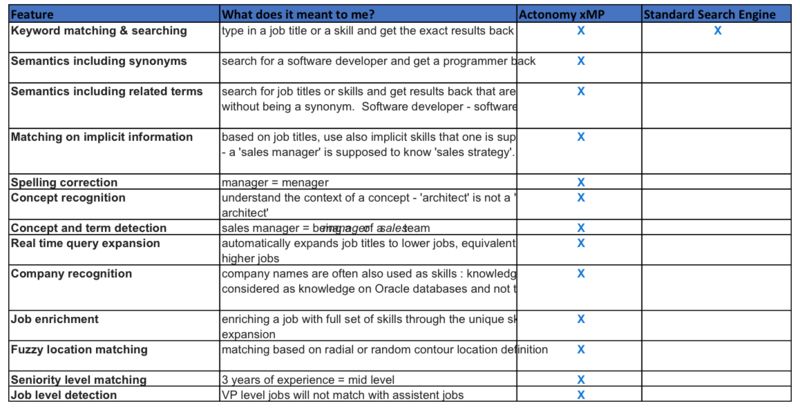 Sometimes, an easy and simple overview will tell you more than extended white papers….. We all know the theory behind semantic technology – we all know that semantics really understand what you are looking for and in what context…. But what does this really mean? 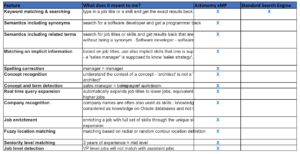 Although many semantic search engines claim to understand what a ‘business developer’ is, the reality is that nearly all job sites return ‘software developers’…. and as such do not understand what you are looking for. That is what we call an ‘upgraded standard search engine’ and not a ‘semantic search engine’! This is what semantic technology will bring you! The technology behind all this is not relevant but if you really want to know it : Actonomy combines uniquely machine learning, deep learning, AI with advanced linguistic processing and semantic modeling such as ontology creation. That is why our hybrid approach (combining different technologies) delivers superior results!